Although this book is categorized as a middle grade novel, this middle-aged adult loved it. Mrs. Bartlett does an excellent job of putting us into the head of eleven year old Mars and the difficulties he faces moving to a new town. The writing isn’t dumbed down for younger readers which made it enjoyable reading and would expand a younger reader’s vocabulary. There were several times when a character would use a word some adults might think to advance for an eleven year that another character would question its meaning, which made this reviewer smile. These instances make the realistic actions and conversations the eleven year olds in this story have realistic. I also liked how aware Mars was of his parents and the thoughts he had about their relationship, and turmoil they were putting him through. His thoughts towards Amelia, a crippled friend he reluctantly makes, illuminated the differences in how boys and girls think and were smile invoking. Anyone looking for a book to take them back to their youth, or have children this age, will enjoy reading this book. Middle grade readers will be trapped within the pages of the book for hours at a time. I look forward to reading more of Mrs. Bartlett’s books. 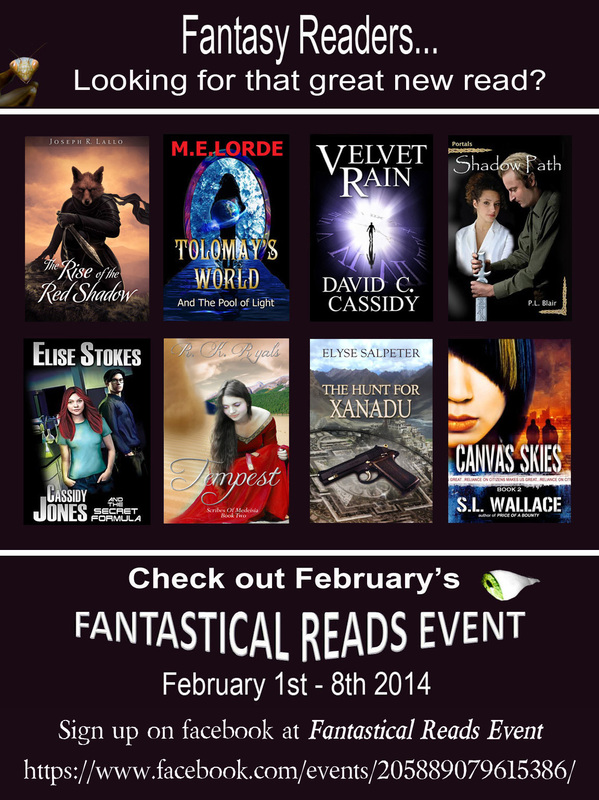 This entry was posted in Book Reviews on February 23, 2014 by Dana Griffin. He asks me about the creative process and where my stories come from. We discuss my two books. Look for an interview of one of his protagonists here in the near future. Thank you for the fun interview, Douglas. This entry was posted in Uncategorized on February 20, 2014 by Dana Griffin. A new author is featured on the eight day M. E. Lorde’s Fantastical Reading Event. Today’s author is Elyse Salpeter, author of thriller novels. Unfortunately I haven’t read the book sponsored here, yet. But I have read another of her novels, Flying to the Light, a young adult thriller. The plot of that story surprised me since Elyse is a mother. She put children into situations that had this adult squirming to get involved in the story and help the characters out. Children shouldn’t have to go through the trauma and difficulties Elyse puts her characters through. The pace of her stories is fast, making this reader forget he should be getting ready to catch flight, or get some much needed sleep. This entry was posted in Uncategorized on February 4, 2014 by Dana Griffin. Starting today, February 1st until February 8th, these writers are being presented on M. E. Lorde’s Fantastical Reading Event. 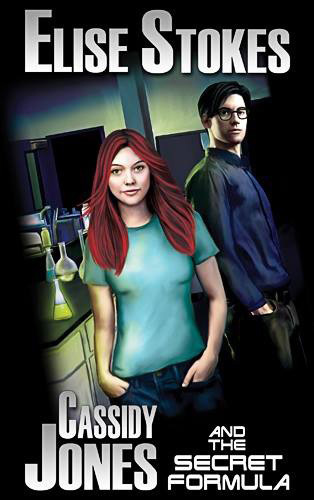 The author being sponsored today is Elise Stokes, author of three young adult superhero series, Cassidy Jones. I’ve read all three of her novels, Cassidy Jones and the Secret Formula, Cassidy Jones and Vulcan’s Gift, and Cassidy Jones and the Seventh Attendant, and can’t wait for the fourth one to be released this year, Cassidy Jones and the Luminous. Although listed as young adult, any age reader would enjoy the antics Cassidy and her genius best friend Emery get into. Reading these books will deepen your smile and worry lines. There are some very tender scenes that’ll make you want to give Cassidy a hug. I hope you enjoy her books as much as I do. Summary: Cassidy takes Emery into her confidence. Impulsively, or maybe intentionally, he grabbed my hand, holding it between his. “Please, tell me,” he repeated. “What do you mean by ‘changed’?” he asked, slowly and calmly, squeezing my hand. Emery’s gaze ﬁxed on my unsteady ﬁngers, watching as I pinched the surgical tape and hesitantly pulled the gauze away, exposing my forehead. His eyes ﬁlled with disbelief. Shaking his head, his gaze dropped to his hands in his lap. Does he think this is a joke? Furious, I slapped the gauze on my forehead. “Trust you? Apparently that was a mistake.” Abruptly, I stood up, causing the swing to sway. Glaring, I sat. I had nowhere else to go. “Why would she keep it a secret from you?” I asked, truly interested. Despite the situation, I laughed. He found my behavior odd? I also thought the “million years” was an exaggeration. I had a feeling Emery wasn’t in the dark about anything for long. “Okay, now you know everything. What do you think?” Silence was his only response as he studied my face. His scrutiny reminded me of his mother’s—clinical, detached—like he observed me under a microscope. This was disturbing, to say the least. Emery spoke with such earnest conﬁdence that I couldn’t help but believe him. Nodding agreement, I dabbed my wet eyes with my sleeve. “That’s one way to look at it,” Emery said, dismally looking at the woods. For several seconds he didn’t speak, lost in thought. During those quiet seconds, I stared at the ground, not thinking, only waiting. When I felt his eyes on my face, I looked up. His expression was determined. Quickly, I explained again. Finishing the account, I held my breath expectantly. Actually, I wasn’t. A black cat near the path leading to the woods had caught my eye. Low to the ground, it focused intensely on something in the tall grass. I recognized what it was doing because I had done it myself. The cat was hunting, stalking its prey. After commando-crawling toward its victim, it sank low in the grass, anticipating the kill. Opportunity arrived. Black fur gracefully glided through the air. The cat easily landed on the unfortunate victim: a brown ﬁeld mouse. I took this as a yes. Oh, geez. Rising to the challenge, I adjusted the couple until they appeared a few feet away. On their stomachs, they turned their heads in so they were nose to nose. “No prob.” I smiled conﬁdently, weeding through surrounding noise. After a moment, I tuned into the man’s husky whispers. “Okay, got them. He’s saying—” My jaw dropped. Immediately, I severed the connection, but not before turning bright red. Still blushing, I watched him sternly. Every time he looked at me, he laughed harder. Child prodigy or not, ultimately, boys will be boys. Taking a deep breath, he suddenly composed himself. “Sorry, Cassidy, but your expression was hysterical. You’ve convinced me that you heard them.” He grinned. Closing my eyes, I sniffed the air. There were so many competing scents. “Is it sweet?” I asked. “Are you asking me to toss you off here or break your ﬁngers?” I teased, slightly squeezing them. 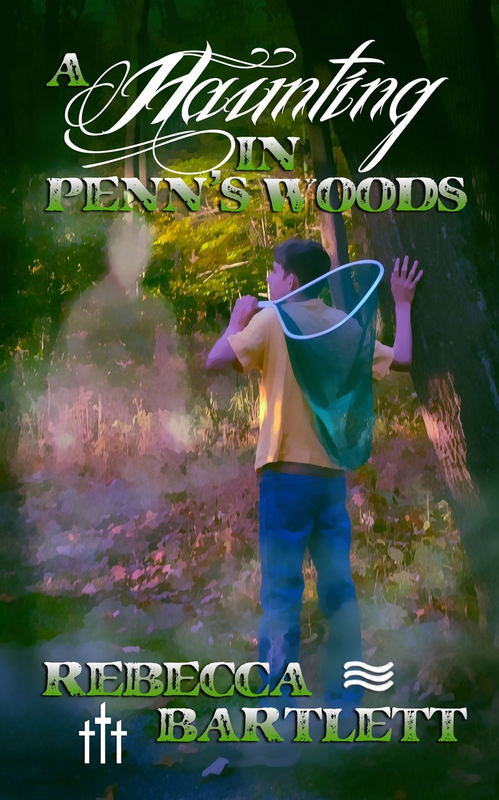 While following the path through the woods, Emery’s eyes roamed for that something discreet. About a hundred feet in, he suggested, “Let’s get off this main path. Over there.” He pointed to a thinly trodden trail cutting through thick growth. Stepping into a clearing, he pointed to a fallen tree twenty feet ahead. Smiling, I decided to show him leaping before strength. “Stand back,” I warned, pushing him aside. Then, running forward, I leaped for the target. Leading with my right foot, my body glided easily through the air. The exhilaration I had felt while speeding around the school track returned, and that strange, pent-up feeling released. For whatever reason, this very unnatural thing felt as natural as walking to me, and incredibly freeing, as if I had been meant for this. My right foot touched the top of the massive trunk,and my left pulled in next to it. The landing had been perfect, steady and strong, without even a hint of balance loss. Pivoting on the trunk to face Emery, I smiled smugly. His praise wiped the smile off my face. “Cat,” I grumbled to myself. “What’s up with the cat theme?” With a sigh, I hopped down next to him. “I suppose you want me to move this.” I patted the thick tree trunk. My ears quickly searched. “All clear,” I announced, moving up to the trunk. Emery stepped back, his face shining with anticipation. Resting my palms against the trunk, I prepared to move the giant tree. Pulling in a breath, I pushed. The tree was heavy, but with exertion, the giant’s resistance gave way. I rolled the trunk up out of the indented ground. From underneath, something scurried up the trunk near my left hand. Squealing, I jumped back. The thick trunk rolled back into its resting place. For the next couple of hours, Emery sought out all kinds of challenges, from moving boulders and leaping into trees, to distinguishing sounds and scents. He even had me describe in detail what tree bark looked like microscopically. Something else took place during this time. My unease around Emery disappeared. In fact, it amazed me just how comfortable I felt around him. Though he was my age, he had none of the uncertainties we teens are usually plagued with. For the most part, I walked on eggshells around girls my age. Saying or doing the wrong thing could trigger an instant “girl war.” Even though my friends weren’t petty, instinctively, I was careful. The boys weren’t as sensitive but were every bit as gossipy. So in general, I watched my back, never letting my guard down. It was exhausting. With Emery, I believed I could be myself, say the wrong thing, do the wrong thing, and he wouldn’t hold it against me. He really was a breath of fresh air. Back at the main path, we parted ways. The plan was for Emery to go to one entrance and me to the other. After listening to be sure the coast was clear, I would tune in to him where he would be looping a countdown out loud. From my end of the path, I tuned in to the woods. All I heard was Emery’s looping countdown. Positioning myself to run, I listened. I took off at a mind-boggling speed. Within seconds, I stood before Emery. Wide-eyed, he stared at me like he’d seen a ghost. “Unbelievable,” he uttered above a whisper. His reaction made me edgy. “How fast do you think I ran?” I asked, attempting to sound casual. “My guess would be forty miles per hour. Imagine how fast you would be on a solid, straight surface. I’ve never witnessed anything like this.” His mouth pulled down in the corners. With an anxious feeling in my gut, I studied him. His face held no expression, as if he wore a mask to hide real emotions. The more I looked at him, the more I believed the emotion he hid was fear. If he’s terriﬁed of me, everyone will be, I anguished. “What do you want me to do now?” I said sheepishly. “Nothing,” he answered, distracted. “Let’s head out.” He motioned for me to walk ahead. Something scratchy brushed my cheek, interrupting the thought. Reﬂex kicked in, and before a second passed, I was crouched on a tree branch, looking down at Emery. Smirking, he waved a dry tree branch in his hand. “What’s the big deal?” I snapped, hopping down. Glaring hard, I grumbled, “Nice. Real nice.” With my shoulder, I shoved past him, stomping down the path. He grinned with understanding. “Oh, you think I’m afraid.” Walking toward me, he continued, “Cassidy, I’m fascinated, hardly afraid. Not of you, at least. I am concerned about you being exposed, though.” He stopped in front of me. After quick scrutiny, Emery released my arms. Calm replaced the alarm on his face. I believed this expression was his standard mask. For a moment, I studied the mask that showed no signs of strain or worry. As far as facades go, it was a solid one, but I wasn’t fooled. I knew the turmoil that had to be going on underneath. “Emery, I’m sorry about your mom,” I said for the ﬁrst time. Tightening his lips, he nodded acknowledgment. Staring up at him, I let his words sink in.He plans to protect me. I’m not alone. With this realization, I threw my arms around his neck, like he was a life preserver. “Thank you,” I said in one grateful breath, tightening my arms. Grabbing my biceps, he attempted to loosen the hold. “A little tight,” he choked. “Oh.” Blushing, I released him. “Thank you,” I whispered, believing every word. As he continued to smile, a curious glint appeared in his black eyes. “My mom will shed light on the situation when we get her back,” he said in a casual tone. Knitting my brow, I rewound his previous statements to ﬁgure out what I had missed. This entry was posted in Uncategorized and tagged adventure, criminal, friendship, super hero, thriller, young adult on February 2, 2014 by Dana Griffin.